Get some cultural insight at Little Sable Point Lighthouse and Grand Haven Lighthouse and Pier. Escape the urban bustle at Holland State Park Beach and Oval Beach. Venture out of the city with trips to J. Petter Galleries (in Douglas), Silver Beach County Park (in Saint Joseph) and 12 Corners Vineyards (in Benton Harbor). Pack the 16th (Tue) with family-friendly diversions at Nelis' Dutch Village. Next up on the itinerary: enjoy the sand and surf at Silver Lake State Park, get in on the family fun at Michigan's Adventure, don't miss a visit to Rockford Dam Overlook, and examine the collection at Gerald R. Ford Museum. For maps and more tourist information, refer to the Grand Rapids trip itinerary planner. Appleton to Grand Rapids is an approximately 6-hour car ride. The time zone changes from Central Standard Time (CST) to Eastern Standard Time (EST), which is usually a 1 hour difference. In July, daily temperatures in Grand Rapids can reach 82°F, while at night they dip to 61°F. Wrap up your sightseeing on the 16th (Tue) early enough to travel to Buffalo. Kick off your visit on the 17th (Wed): indulge your thirst for a good beer at Magic Hat Brewing Company, deepen your understanding at Shelburne Farms, then examine the collection at Shelburne Museum, and finally indulge your thirst for a good beer at 1st Republic Brewing Company. Get ready for a full day of sightseeing on the 18th (Thu): hike along Stowe Recreation Path, then hit the slopes at Smugglers' Notch Resort, and then brush up on your knowledge of spirits at Green Mountain Distillers. For where to stay, more things to do, traveler tips, and other tourist information, refer to the Stowe trip itinerary planning site . Traveling by combination of flight and bus from Grand Rapids to Stowe takes 10 hours. Alternatively, you can do a combination of bus and flight; or drive. Traveling from Grand Rapids in July, Stowe is little chillier at night with lows of 56°F. Wrap up your sightseeing on the 18th (Thu) early enough to drive to Woodstock. Woodstock is the shire town of Windsor County, Vermont, United States. On the 19th (Fri), indulge your thirst for a good beer at Harpoon Brewery, then cool off at Upper Valley Aquatic Center, and then take in breathtaking views at Quechee Gorge. On the 20th (Sat), you'll have a packed day of sightseeing: explore the wealth of natural beauty at Marsh - Billings - Rockefeller National Historical Park and then look for all kinds of wild species at Eshqua Bog Natural Area. For more things to do, ratings, traveler tips, and tourist information, go to the Woodstock route builder website . Traveling by car from Stowe to Woodstock takes 2 hours. Alternatively, you can take a train; or take a bus. Expect a daytime high around 83°F in July, and nighttime lows around 59°F. Wrap up your sightseeing on the 20th (Sat) to allow time to drive to Manchester. Manchester is a town in, and one of two shire towns (county seats) of, Bennington County, Vermont, United States. On the 21st (Sun), take in nature's colorful creations at Hildene, The Lincoln Family Home, then admire the masterpieces at The Clark Art Institute, then admire the masterpieces at MASS MoCA, and finally indulge your thirst for a good beer at Bright Ideas Brewing. Get ready for a full day of sightseeing on the next day: fly down the slopes at Mount Snow Resort, then learn about winemaking at Amorici Vineyard, and then appreciate the history behind Saratoga Monument. For maps, traveler tips, photos, and other tourist information, read Manchester route builder tool . Traveling by car from Woodstock to Manchester takes 2 hours. Alternatively, you can take a bus. July in Manchester sees daily highs of 81°F and lows of 58°F at night. Cap off your sightseeing on the 22nd (Mon) early enough to travel to Buffalo. Escape the urban bustle at Cave of the Winds and Niagara Falls. Get some cultural insight at The Strong National Museum of Play and Our Lady of Victory Basilica. You'll find plenty of places to visit near Buffalo: Jell-O Gallery Museum (in Le Roy), Bridal Veil Falls (in Niagara Falls) and Letchworth State Park (in Castile). Next up on the itinerary: try to win big at Seneca Niagara Casino, steep yourself in history at Theodore Roosevelt Inaugural National Historic Site, expand your understanding of the military at Buffalo & Erie County Naval and Military Park, and admire the landmark architecture of Frank Lloyd Wright's Darwin D. Martin House Complex. To find out how to plan a trip to Buffalo, use our trip itinerary maker. Do a combination of bus and flight from Manchester to Buffalo in 6 hours. Alternatively, you can drive; or do a combination of bus and train. In July, daily temperatures in Buffalo can reach 80°F, while at night they dip to 63°F. Cap off your sightseeing on the 26th (Fri) early enough to travel back home. Bar Harbor is a town on Mount Desert Island in Hancock County, Maine, United States. Kick off your visit on the 27th (Sat): don't miss a visit to Land Bridge to Bar Island, kick back and relax at Sand Beach, and then take in the awesome beauty at Cadillac Mountain. Get ready for a full day of sightseeing on the 28th (Sun): contemplate in the serene atmosphere at St. Saviour's Church :, get up close to creatures of the deep with a dolphin and whale watching tour, then look for all kinds of wild species at Shore Path, and finally go for a walk through Compass Harbor Trail. To find photos, maps, ratings, and more tourist information, you can read our Bar Harbor online driving holiday planner . Getting from Buffalo to Bar Harbor by flight takes about 8 hours. Other options: drive; or take a bus. Traveling from Buffalo in July, expect Bar Harbor to be a bit cooler, temps between 75°F and 58°F. Cap off your sightseeing on the 28th (Sun) early enough to travel to Lincolnville. Lincolnville is a town in Waldo County, Maine, United States. Start off your visit on the 29th (Mon): kick back and relax at Pitcher Pond, learn about winemaking at Cellardoor Winery, and then take in the awesome beauty at Mount Battie. For traveler tips, ratings, reviews, and other tourist information, read Lincolnville trip itinerary planner . Traveling by car from Bar Harbor to Lincolnville takes 2 hours. In July, daily temperatures in Lincolnville can reach 74°F, while at night they dip to 58°F. Wrap up your sightseeing on the 29th (Mon) early enough to travel to Phippsburg. Phippsburg is a town in Sagadahoc County, Maine, United States, on the west side of the mouth of the Kennebec River. Start off your visit on the 30th (Tue): step off the mainland to explore Seguin Island and Lighthouse, then steep yourself in history at Fort Popham State Historic Site, and then stroll through Popham Beach State Park. Get ready for a full day of sightseeing on the next day: admire the majestic nature at Reid State Park, see the interesting displays at Maine Maritime Museum, and then tour the pleasant surroundings at Cliff Trail. To find traveler tips, ratings, maps, and tourist information, refer to the Phippsburg tour itinerary maker website . Traveling by car from Lincolnville to Phippsburg takes 1.5 hours. In July, daily temperatures in Phippsburg can reach 79°F, while at night they dip to 59°F. Finish your sightseeing early on the 31st (Wed) to allow enough time to travel to Ogunquit. Start off your visit on the 1st (Thu): kick back and relax at Long Sands Beach, then admire the masterpieces at George Marshall Store Gallery, then explore the striking landscape at Perkins Cove, and finally get to know the fascinating history of Marginal Way Walkway. Keep things going the next day: take an in-depth tour of USS Albacore Museum, tour the pleasant surroundings at Hampton Beach State Park, then look for gifts at Stonewall Kitchen, and finally enjoy the sea views from Cape Neddick Nubble Lighthouse. For photos, other places to visit, traveler tips, and tourist information, refer to the Ogunquit road trip planning website . Traveling by car from Phippsburg to Ogunquit takes 2 hours. 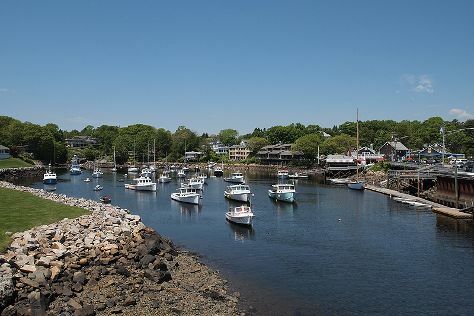 In July in Ogunquit, expect temperatures between 81°F during the day and 58°F at night. Wrap up your sightseeing by early afternoon on the 3rd (Sat) to allow time for travel back home.